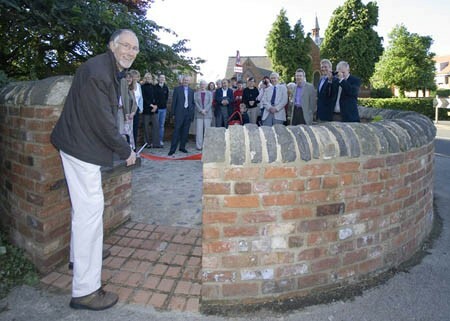 At a ceremony on Friday 29th June attended by about 30 invited guests, the new Pinfold was formally opened. 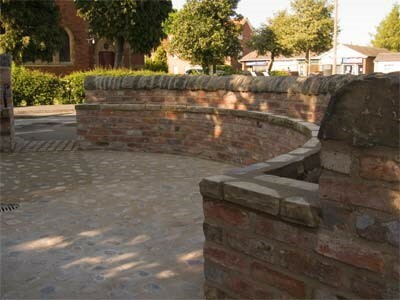 Funded by the Heritage Lottery Fund and the Millennium Trust, the new Pinfold has been designed and built by local people. It has seating and planting, and a soon to be installed historical interpretation panel. It is proving popular with residents and visitors, and is particularly busy when the junior school is about to finish in the afternoons. At a reception to mark the opening, Trust chair John Bettridge thanked all those involved, including Richard Parkin who manged the project, and local historians Linda Haywood and Liam Godfrey. John also launched an exhibition showing how the Pinfold project was developed. The project completes phase 2 of the Crossroads scheme, and a panel shows a concept of how phase 3 may be developed further. The exhibition will be on display at the Library from 16th July.